This article is about the district. For the tube station, see Kingsbury tube station. Kingsbury is a district of northwest London in the London Borough of Brent. The name Kingsbury means "The King's Manor". Its ancient scope stretches north and west to include Queensbury and parts of Kenton and Wembley Park in other directions. Kingsbury was in 2001 a ward and in 2011 was identifiable with the Fryent and Barnhill wards approximately. About 25% of Kingsbury is Fryent Country Park, forming the southern quarter. It is of highly mixed density, ranging from high rise to suburban to a green wildlife reserve in the country park. Kingsbury was historically a rural parish of a fairly modest 6.9 square kilometres (2.7 sq mi) in the Hundred of Gore and county of Middlesex. It formerly included Queensbury. Following local government redrawing of electoral wards Kingsbury corresponds to the Fryent and Barnhill wards and in all of its various older guises, a minority or all of the Queensbury ward. The early English kings had parted with their manor of Kingsbury long before the Conquest. An estate called Tunworth, in the northern part of Kingsbury parish, was granted by Edwy to his thegn Lyfing in 957. By 1066 it probably formed part of the manor of Kingsbury, which was then held by Wlward White, a thegn of the Confessor, and passed from him to Ernulf of Hesdin who died in 1097 and his lands passed to the family of Walter of Salisbury. Thereafter the overlordship of Kingsbury descended with Edgware manor. By 1086 on the Domesday survey of property, Ernulf's manor in Kingsbury had been subinfeudated to Albold as Lord. It was not mentioned again until 1317, when, under the name of the manor of Kingsbury, it belonged to Baldwin Poleyn of Tebworth. Kingsbury developed little in housing and population in the 19th century, remaining a polyfocal village. In this age, Oliver Goldsmith, writer and playwright, lived at Hyde Farm, Kingsbury (1771–1774); the third Lord Mansfield was buried at St. Andrew's churchyard in 1840. Although it lay close to London, development started slowly, and it was not until after the First World War that the district became built up. An aircraft industry was established in the part of Kingsbury adjacent to Hendon aerodrome during the war, while the road network was improved to cater for the British Empire Exhibition in nearby Wembley in 1924. The number of inhabited houses in the civil parish increased from just 140 in 1901 to 3,937 in 1931. By 1951 this had risen to 11,776. Between 1921 and 1931 Kingsbury's population increased by 796%. John Logie Baird's experimental television transmissions from the United Kingdom to Berlin, Germany were transmitted from the stable block of Kingsbury Manor, now the Veterans Club in Roe Green Park. From 1923 to 1979 Kingsbury Road was the location of the Vanden Plas specialist motor body works, body makers for Bentley and later part of Austin, BMC, and British Leyland. The site is now Kingsbury Trading Estate. In 1894 Kingsbury was included in the urban district of Wembley. However, as Kingsbury had only three councillors on the urban district council to Wembley's nine, Kingsbury's councillors felt the needs of the area were not well-served. In 1900 Kingsbury became a separate urban district with six councillors. The new council was immediately involved in controversy and in 1906 it failed to make a rate or meet its financial commitments. Following an inquiry initiated by ratepayers, the councillors numbered nine, not halting fiscal accusations directed towards the initial three councillors. In 1934 the Kingsbury Urban District was abolished and merged once more in Wembley Urban District. 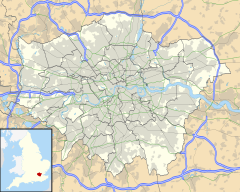 The urban district became a municipal borough in 1937 and in 1965 the area became part of the London Borough of Brent. A congregation of Jews affiliated to the United Synagogue is first recorded in Kingsbury in 1939. In 1942 Eden Lodge at Kingsbury Green was registered for worship, becoming Kingsbury district synagogue in 1954. The 2011 census showed that the Fryent ward's largest ethnic group was Indian at 21%. Whites as a whole form 37% (17% British, 14% Other, 6% Irish). 11% was Other Asian. 41% were Christian, 21% Muslim and 20% Hindu. The Welsh Harp ward, which covers southern areas of Kingsbury Green, was 17% White Other, 17% Indian, and 16% White British. The first two series of BBC children's drama Grange Hill were filmed at Kingsbury High School. Video of Round Here, about George Michael's childhood, features Roe Green Park, Roe Green Primary School and other local landmarks. John Beard (trade unionist), had his last home in 27 Wyndale Avenue at the time of his death in 1950. James Hanratty, among last condemned to hang for murder, lived in Kingsbury. Julie Rogers, singer, was educated and lived in Kingsbury. Courtney Pine OBE, jazz musician, was raised in Kingsbury from age 14. Chris Squire, bassist of Yes, was born in Kingsbury. Tony Kanal, bassist of No Doubt, was raised in Kingsbury. Mutya Buena and Keisha Buchanan, singer/songwriters, Sugababes, born and raised in Kingsbury. Jet Harris, musician with Tony Meehan and The Shadows, was born in Kingsbury. Gary Waddock, Wycombe Wanderers manager, was born in Kingsbury. Jasmyn Banks, actress, was educated in Kingsbury. Stuart Pearce, footballer, raised in Kingsbury. George Michael, singer and songwriter, was raised in Kingsbury. Brian Michaels, theatre and opera director, was born and raised in Kingsbury. Kingsbury Road A4006 is the largest road within the district. ^ Map of established parishes, A History of the County of Middlesex, Volume 5. ^ a b "Places in Brent: Kingsbury", Grange Museum of Community History and Brent Archive, accessed 28 January 2008. ^ "Kingsbury: Introduction", Victoria County History of Middlesex, Volume 5 (British History Online), accessed 28 January 2008. ^ a b "Kingsbury: Local Government", Victoria County History of Middlesex, Vol. 5, (British History Online), accessed 28 January 2008. ^ Good Stuff IT Services. "Fryent - UK Census Data 2011". Ukcensusdata.com. Retrieved 2017-03-22. ^ Good Stuff IT Services. "Welsh Harp - UK Census Data 2011". Ukcensusdata.com. Retrieved 2017-03-22. ^ "Grange Hill (1978–2008) | Filming Locations", IMDB. ^ Who Was Who, 1941–1950. A and C Black. 1952. p. 76. ^ Maya Jaggi (2000-09-30). "Profile: Courtney Pine | Music". The Guardian. Retrieved 2017-03-22. ^ "And the band plays on... - Times of India". Timesofindia.indiatimes.com. 2002-12-01. Retrieved 2017-03-22. Wikimedia Commons has media related to Kingsbury.